This is the perfect desk! I recommended it to anyone looking for something with good price and quality. I actually got the Bordeaux color, not chocolate. These tables are really well-made, and they're laminated on the underside as well as the top side and edges. One of my tables came without screws, but when I call the manufacturer they sent me out the package of screws. My only concern with these tables is that the very bottom of the metal legs is pretty Sharp and people can cut themselves if they're not careful. My son put this desk together last night. All the parts were there and in perfect condition. The pilot holes lined up perfectly with the table legs. He needed a long extension on the drill since one hole on each leg was very close to the edge of the leg so a bit tricky to angle the screw in. Otherwise no problems. The desk is very sturdy and it was level without needing to adjust the feet. 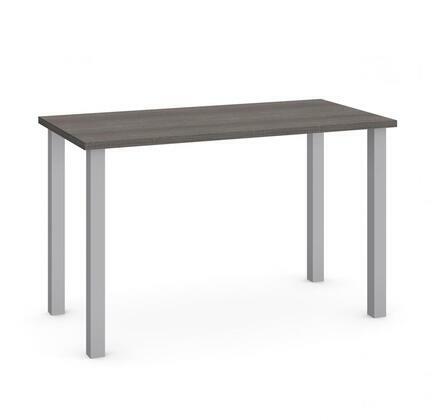 The light maple table top and silver legs look sleek and modern. Very, very happy with this desk.